TSP Legal What is Intestacy? What happens if I don't make a Will? TSP Legal > News > General News > What is Intestacy? When a person dies without leaving a Will they are described as having died Intestate, which means that their estate will be distributed according to the law, and not according to their wishes. Set down in Statute, the rules of Intestacy in England and Wales govern who can deal with the administration process, and who inherits your estate. In many cases this may not be who you would have chosen to act or inherit, had you written a Will. In October 2014 the rules changed to include Civil Partners as beneficiaries, but the Intestacy rules still do not include Cohabitees. In today’s modern Society there are a significant number of Cohabitees who find themselves in a difficult position following the death of their partner. They may no longer be able to live in the house they lived in before the death occurred, or they may not have access to any money to pay the bills. Even if you are married, or in a civil partnership, you may not automatically receive all the estate, under the Intestacy rules. You do receive the chattels in the house, but you may not receive the house itself. You do receive a financial sum, but it may not be sufficient to maintain you or your children. You could find yourself in a situation whereby you have to apply to the Court for provision under The Inheritance (Provision for Family and Dependants) Act 1975, but you may not have sufficient funds to make the application. In order to ensure that your position is safe and secure, take advice from an experienced Wills and Estates solicitor who will deal with any issues you may have and help you put a Will in place. You can then get on with living your life, rather than worrying about what might happen when you or your partner dies. 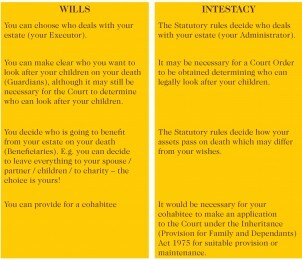 The Rules of Intestacy can be found here.